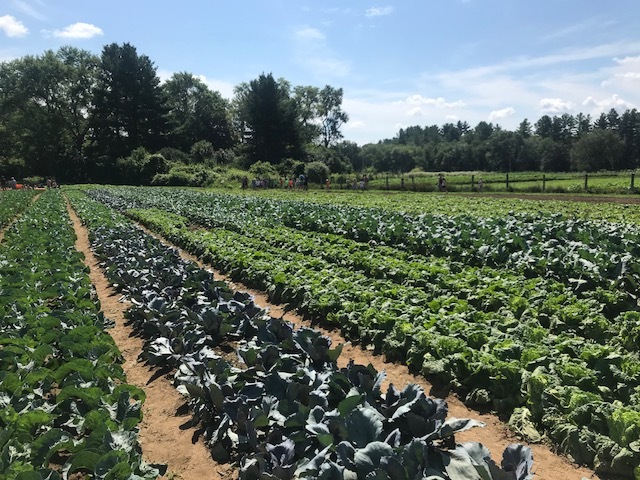 Posted on June 20, 2018 by Kelly M.
With our Spring CSA coming to an end, it’s time to prepare for the summer and all the things that accompany it – most notably our Summer CSA, Farmstand, and visits to the Union Square Farmer’s Market in Somerville. With yesterday’s forecast calling for a 30% chance of showers, we seeded 15 beds of greens, beets, chard, parsley and flowers, and then crossed our fingers, promised to be good, and lo and behold, help arrived! 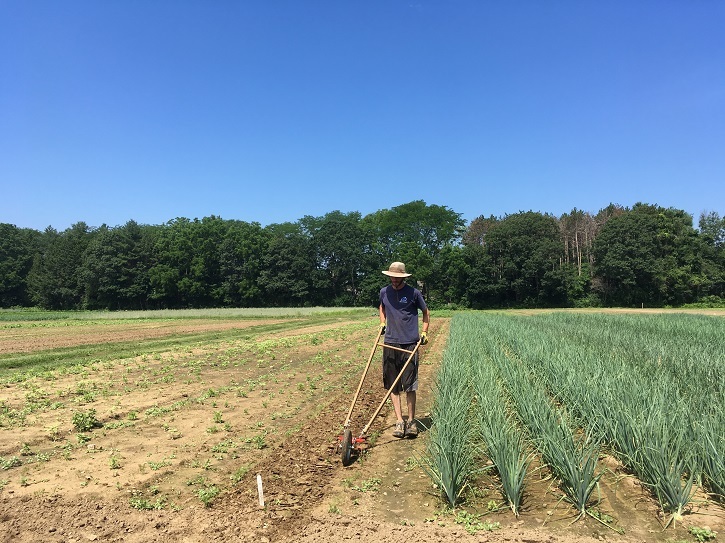 We had been having flashbacks to the drought of 2016 after two weeks of dry and warm weather and poor germination in last week’s field seedings but with significant rain on June 5th and 18th, we’re on track for excellent potato, brassica and onion harvests beginning in July. Our job now is to stay on top of weeds and control populations of Colorado potato beetle, cabbage looper, and onion thrips. To that end, we started applying certified organic sprays where we have noticed pest outbreaks this past Saturday. 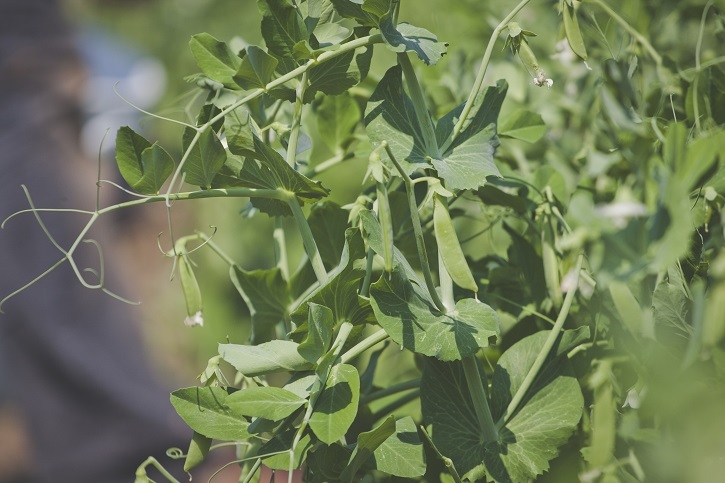 Entrust, Trident and Dipel are the trade names of three different formulations of bacteria that target pests specific to these crops. In order to be effective, the bacteria must be ingested by the pest feeding on the leaves. We spray only in the evening, as prolonged leaf wetness gives the best result; dry and sunny conditions quickly degrade the bacteria. 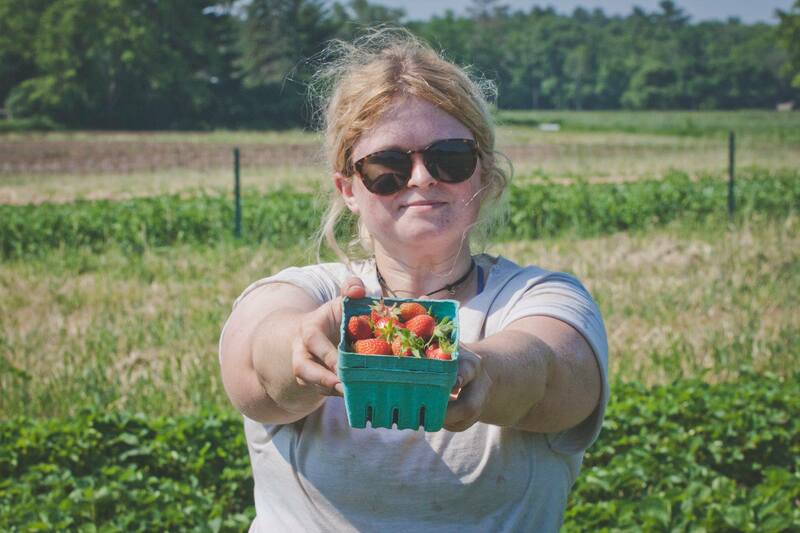 It is the peak of the strawberry harvest, and the Crops Team has been spending long periods in the patch bringing in the beautiful berries (find a quart for yourself at the farmstand right now). 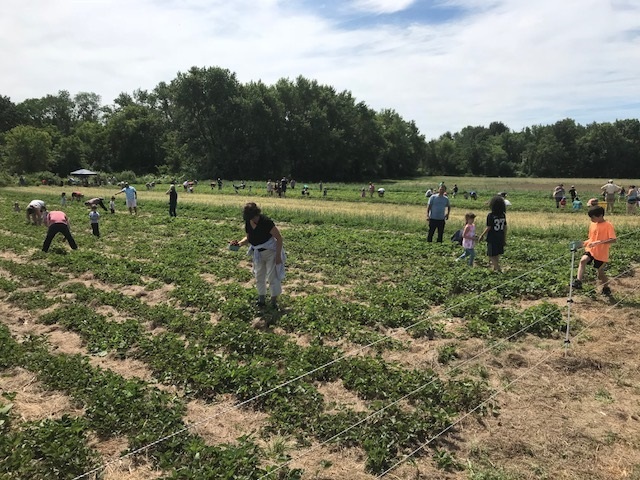 On Friday, we were helped by 25 volunteers with AAFCPA, the firm that handles Mass Audubon’s accounting and auditing, in picking strawberries. 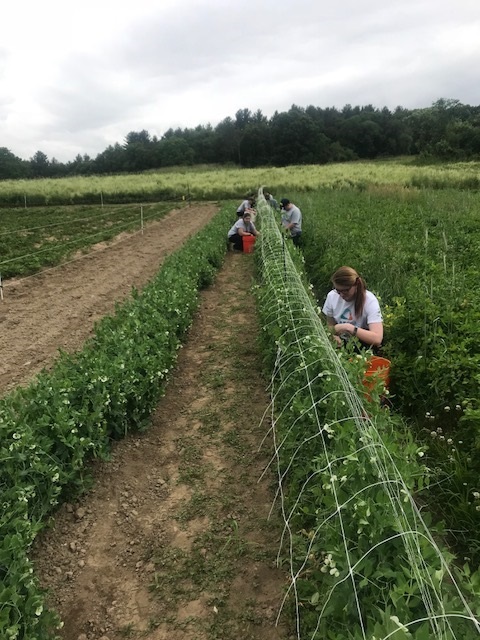 The volunteers picked strawberries for two hours and after lunch harvested peas (picture d below and garlic scapes, before weeding carrots–4.5 hours of top-notch work! Assistant Farmer Sarah Lang raved about the quality of the berries she sold at the Union Square Market on Saturday thanks to the careful work of these volunteers. Back at the farm, Saturday’s Pick-Your-Own Strawberry Day (picture below) was a big success! Our thanks to the admissions staff for handling a high volume of sales, and to farmers Jill Banach and Sarah Stockdale for helping visitors find the best berries in the field. 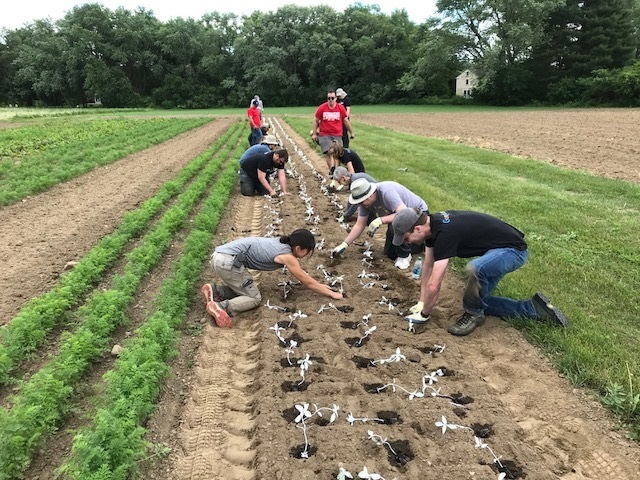 Earlier in the week, volunteers from Marshalls and Starbucks helped us weed carrots (pictured below) and plant winter squash on two separate days. 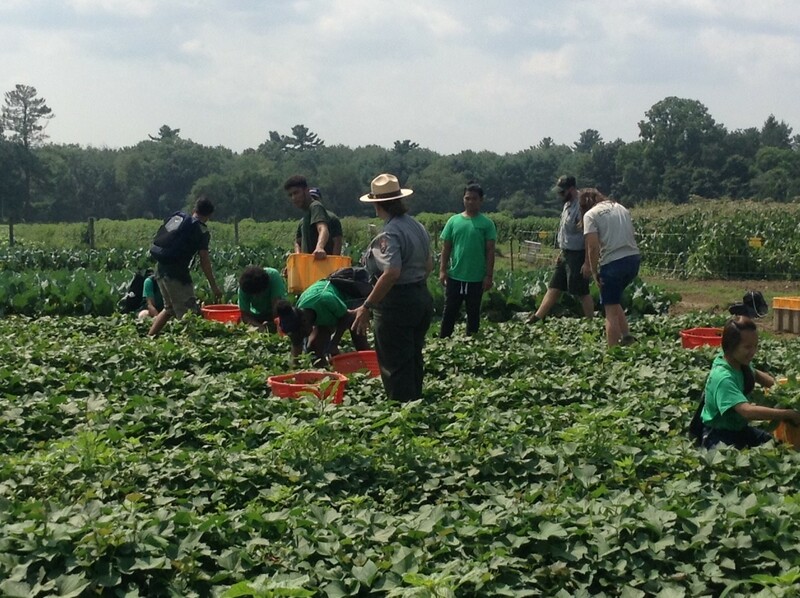 Last year, we planted the entire acre of winter squash and gourds in one afternoon with one volunteer group. On Saturday afternoon, six community volunteers helped us finish establishing this year’s winter squash patch. While we were doing that, Farmer Andrew Kelliher was off wheel-hoeing fifteen beds all on his own—somewhere, Hercules just got an idea for a 13th labor! On Thursday afternoon, Google volunteers moved over an entire field checking off jobs in rapid succession. They weeded carrots, planted sunflowers (pictured below), harvested peas, weeded those peas, and then planted summer squash. Wow! Thanks to all the volunteers, visitors and farmers for another wonderful week in the field. Want to taste the fruits of our labor? 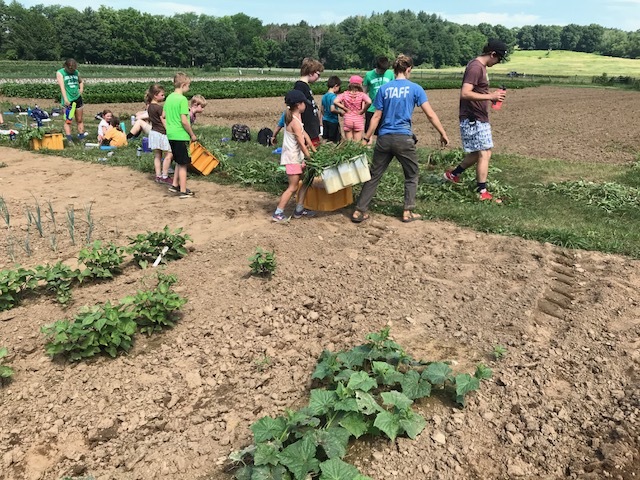 Summer CSA starts next week and registration is open. Would you or your group like to help in the field too? See more details here. 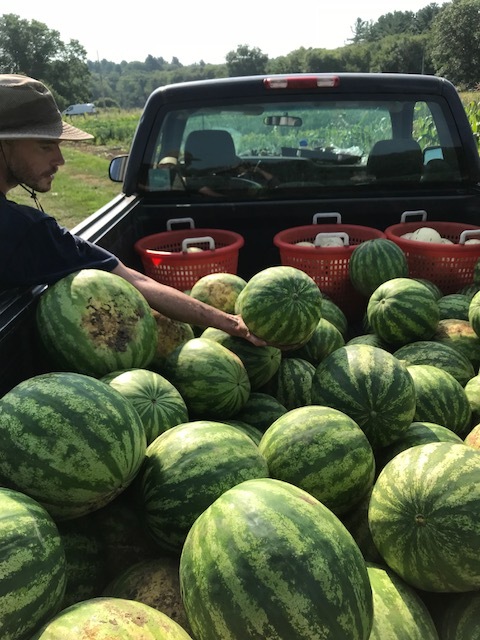 This entry was posted in Farming and tagged crops update, csa on June 20, 2018 by Kelly M..
Posted on June 14, 2018 by Kelly M.
Have you registered for a Summer CSA program yet? Will we see you at Strawberry Day? Start cooking rice in a rice cooker. Drizzle dressing onto your cooked rice and veggies. Eat this over the sink (no dishes!) while listening to the Red Sox (optional). Voila, caveman’s dinner! While that’s jone way to expand time in the kitchen, while in the field, the time to accomplish tasks shrinks as hands multiply. 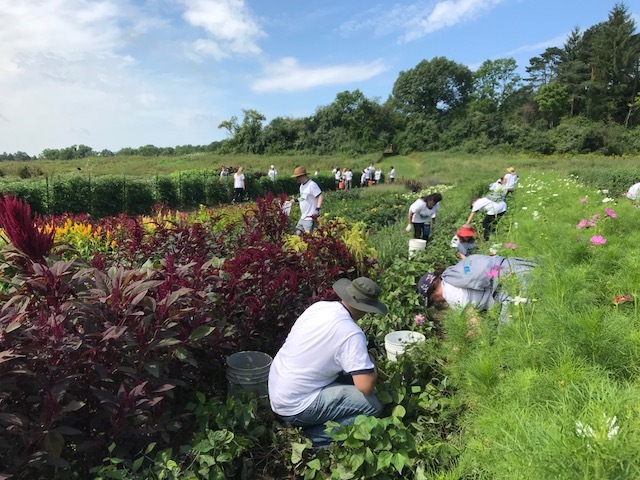 On Tuesday, volunteers from Harvard Business School’s IT department—many with a love of gardening and the outdoors—came to the fields despite a forecast for rain. All went well for about twenty minutes, but then it poured, and it wasn’t warm. On the bright side, they were so happy to be out from behind their desks that they voted to work on. The fields eventually became muddy to the point where we had to stop planting cucumbers and switch to weeding strawberries up on the straw. The resulting patch looks great, bravo and thanks again to all! 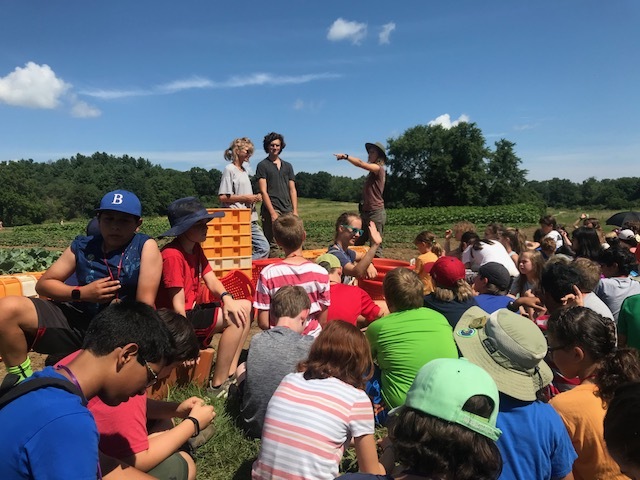 On Thursday morning, Emma and the Crops team oriented all the camp counselors to the fields and to the upcoming weed-outs. We then weeded in the carrots before picking strawberries to sell at the farmstand. Thank you, counselors, for your good work! On Thursday afternoon, volunteers from Goldman Sachs planted rosemary, scallions, and basil before weeding carrots. This is the second group this season to make a donation to fund our purchase of rosemary plants, and we have been selling all we can harvest to Iggy’s Breads. Thank you Goldman Sachs volunteers for your good cheer and speedy work. 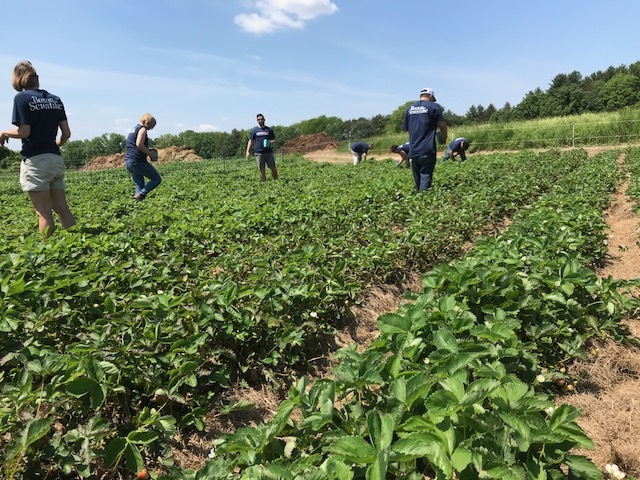 On Friday morning, volunteers from Boston Scientific planted the dahlias they had helped us purchase, and then harvested four flats of strawberries (pictured below), all of which we sold the following day at market. 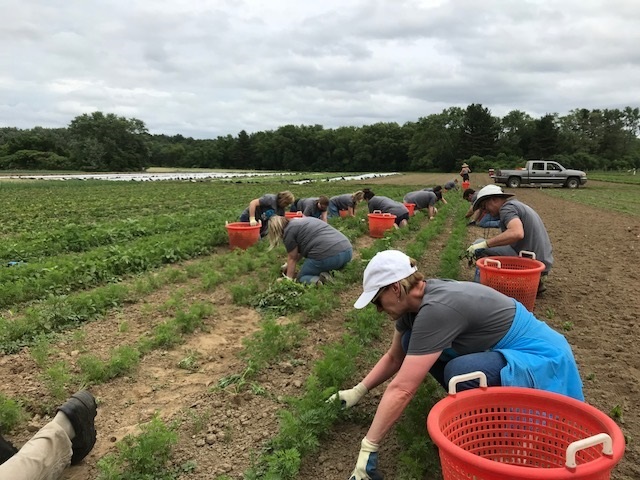 2,500 sweet potato slips arrived in the mail from Tennessee on Thursday, and because The Boston Scientific volunteers had helped us finish the strawberry harvest before noon, we had time after lunch to plant almost all of them. Ten volunteers from the community helped us finish the sweet potato job, put away row cover, and, of course weed, on Saturday afternoon. In Dr. Who, the spaceship The Tardis, because of inter-dimensional stabilizers (wink!) is in two places at once, and simultaneously small and enormous. At Drumlin, a police-box of a week becomes as roomy as Versailles, not because of weird science, but because of what we do together. In one antechamber of the week, Andrew Kelliher and volunteer Fred Costanza put electric fencing around the strawberries to keep deer and turkeys out. In another, Sarah Lang and Sarah Stockdale delivered veggies to our newest restaurant account, Eataly, in the Prudential Center. 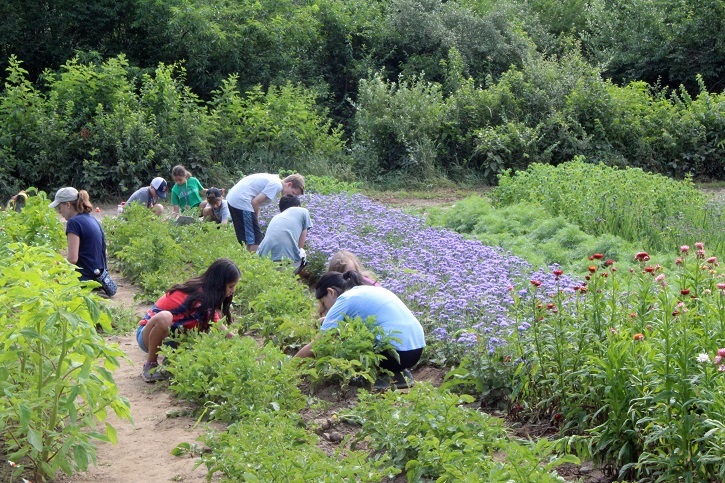 There are two distributions remaining in the spring CSA, but the fun doesn’t have to end. 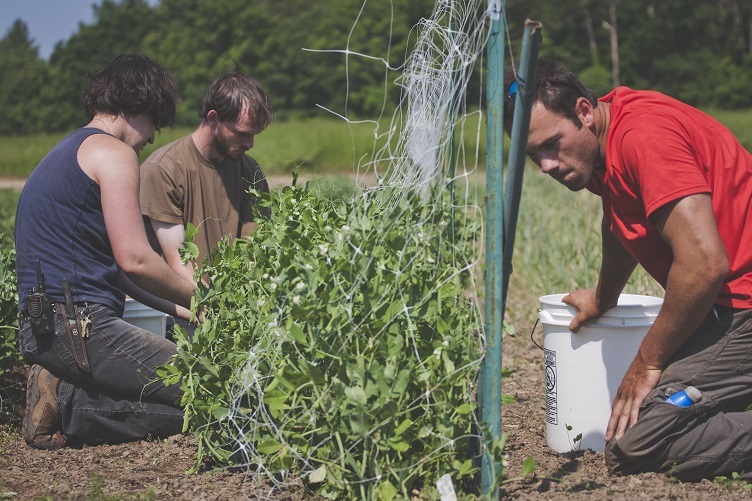 The summer CSA program begins on June 27th and it’s not too late to join. With the summer brings options for Pick Your Own, Full and Half Shares, Flower Shares, perfect for enjoying the warm sunny season! You’ll find strawberries at the stand this week, with a broader variety of veggies becoming available this weekend. On Saturday, June 16th we’ll also be celebrating Strawberry Day on the farm, where you’ll have the opportunity to pick your own strawberries (while supplies last!) and take part in special activities throughout the farm. 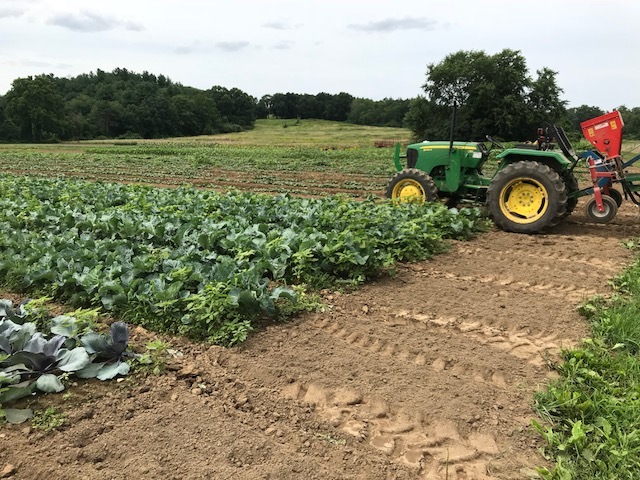 This entry was posted in Farming and tagged crops update, csa on June 14, 2018 by Kelly M..
Posted on June 9, 2018 by Kelly M.
After four days in the 80’s with no rain last week, so we’re grateful for today’s cool and wet weather. We had been trying to stay out of the greenhouse on hot days, but by the end of last week, we had fallen more than a week behind schedule on indoor work—a problem considering most of our successional seedings are separated by 14 days. On Friday, despite the temperature being over 90 in the greenhouse, volunteers Francesca, Sheila, and Sandra breathed shallowly and repotted the second succession of tomato seedlings—1,000 plants in need of more room to grow. And on Saturday morning, the Crops team seeded over 70 flats in the muggy heat. Nice work powering through, all! We’re caught-up for the moment with only one large-scale greenhouse seeding project left for the season—40 flats of pumpkins scheduled for later this week. We’ll be moving 50 flats of winter squash out to the cold frame to make way for those pumpkins. This procession of plants from greenhouse, to cold frame, to field, is our focus in May and June. All this transplanting and seeding is like laying hemlock boughs on a pyramidal bonfire—for a moment you see only smoke (radishes? ), then the core grows hotter and becomes a mountain of flame—summer’s harvest. And toward that end, last week we transplanted cantaloupe, watermelon, the second round of sweet corn and cauliflower, and the popcorn we’ll be harvesting come October. We were helped with this from four master gardener volunteers on Tuesday and four community volunteers on Saturday. 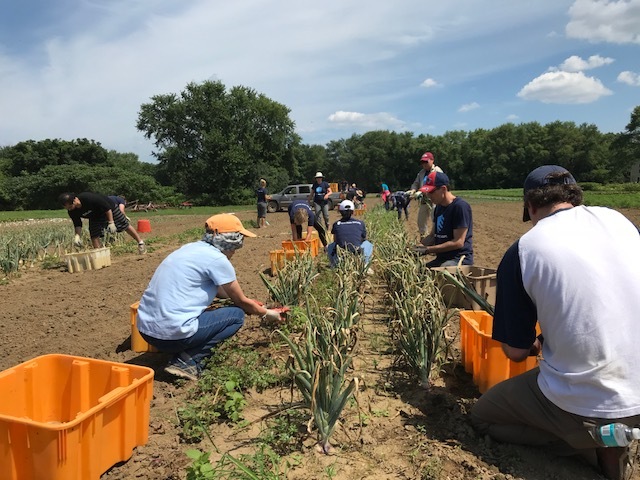 Volunteers also helped us weed in the onions—fifteen beds down with one to go! Thanks to all for helping us establish and maintain the plantings. Many crops are faring well this spring, but we are seeing more damage from leafminers in chard, beets and spinach than in any previous year. You can view the latest newsletter from May 24 2018 Vegetable Notes for more information about this and other pests. Next spring, we’ll have to consider covering those crops in addition to the onions and greens we already protect. This coming Saturday, as part of the celebration marking the opening of the Environmental Learning Center, we’ll stock the farmstand for the first time this season. 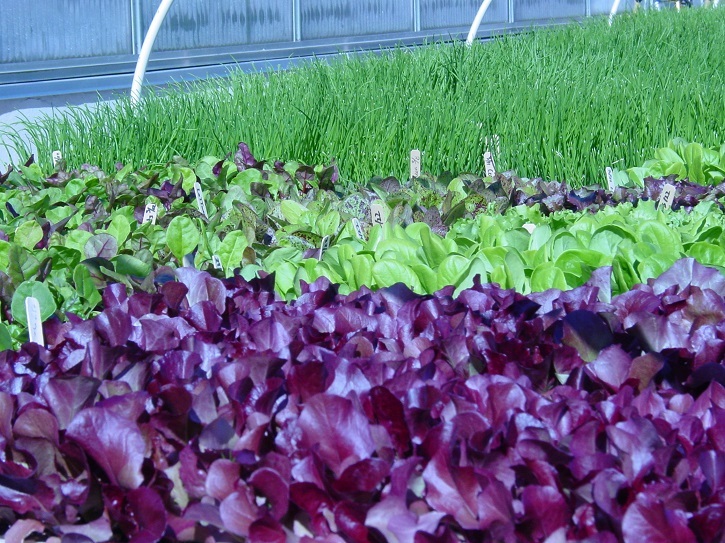 Stop envying those savvy spring CSA members and come get your own! Or, register for our Summer CSA and get regular, quality produce every week! This entry was posted in Farming and tagged crops update, csa on June 9, 2018 by Kelly M..